Assembling the chair proved to be a test of patience as well, since I needed to clean the flashing off of the back of the chair. The lace work on the back of the chair was a tedious chore and the whole time I was worried about accidentally cutting it with my fresh blade. ended up being OK, but when I went to put it on the base I realized that the base had pegs for mounting the chair to it. But the legs didn't have holes in them for the pegs to go into. So I ended up cutting off 90% of the pegs and gluing the chair straight onto the floor. 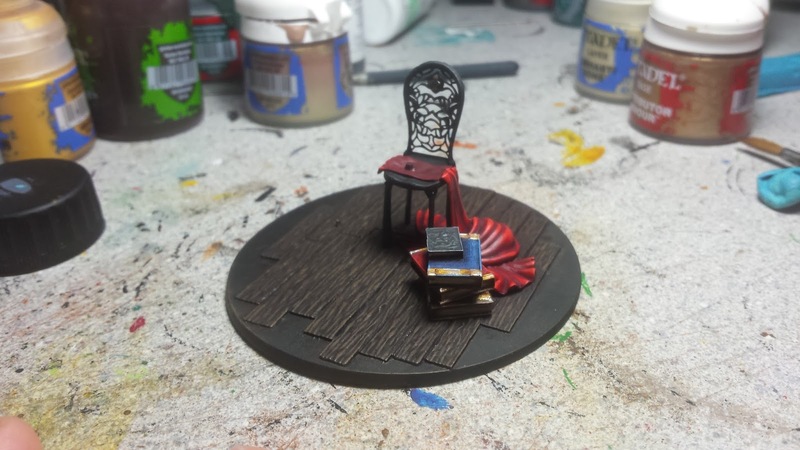 With it all assembled, I undercoated it with Chaos Black and started working on the floor. The floor was painted with a base coat of Rhinox Hide and then highlighted up with lighter browns drybrushed one after another. Then, I used Agyax Earthshade to tone down the highlights a bit. This was followed by Rhinox Hide being reapplied to the cracks between the planks, followed by a Nuln Oil wash. 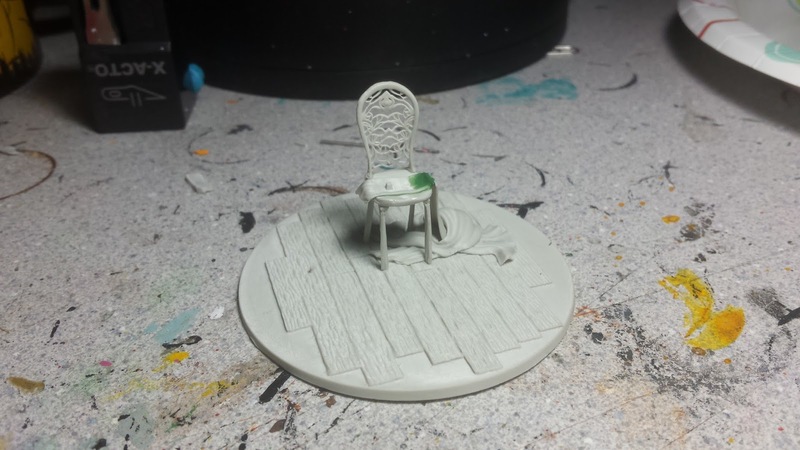 The chair was painted black and then highlighted with lighter greys. I left out the highest highlight though, those will be done after the lady is in place on it. I tried using the gemstone paints on the gems for the chair, but didn't care for the results, I ended up going back over them with green and painting them the old way. The artwork for the model shows her sitting on a black chair with a black cloth hanging off of it. But honestly, thats too much black and I had to change it. Obviously I had to go with red, since its both my favorite color and one of the colors I can knock highlighting out of the park with. After that was done, it was on to the books. 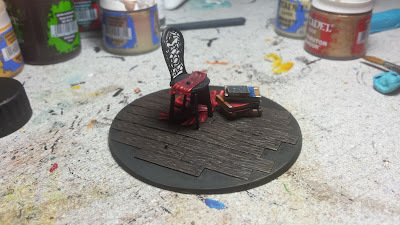 There are two stacks of books that go on the base, each of which I painted a different color, all with gold trim. They proved to be a bit of a challenge, but I think they ended up looking pretty solid. 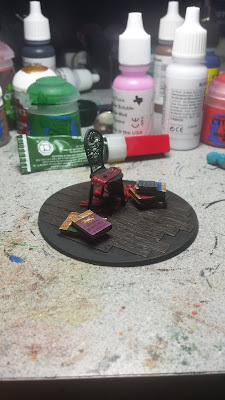 With the books finished, the base is all set for now (other than the lamp which I forgot about). It's now on to the lady herself, which if you've been following on Twitter you know she's already pretty far along. But I'm going to save her for the next WIP post. But, you can watch the progress unfold over on Twitter or Instagram in a more play-by-play as it happens fashion.